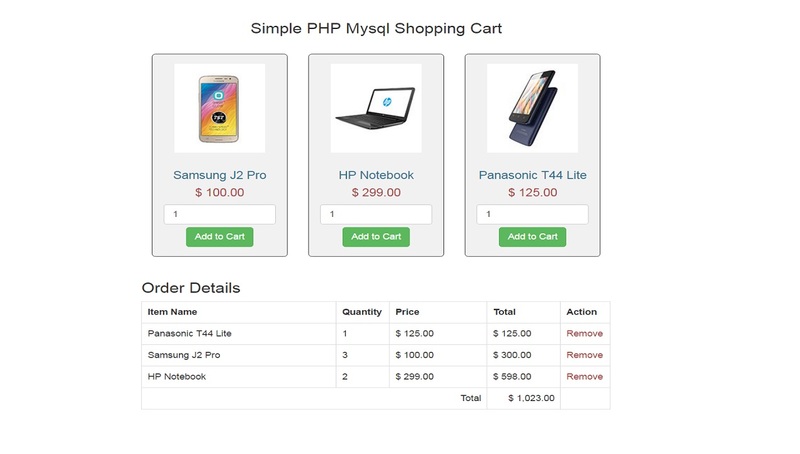 If you want to looking for a making of simple PHP MySQL shopping cart tutorial? Here is the good news for you, here have learn a step by step making of shopping cart and easy to follow this tutorial. In this post we are going to learn how to make a simple PHP shopping cart application. This PHP shopping cart script is purposely kept as simple as possible for beginner php programmer. Here I have to describe how to displaying product list from MySql database. In each displaying product we have given options for entering item quantity and add that item to shopping cart and that shopping cart items will be stored into a session variable and if you want to remove item from shopping cart then you can clear session variable and can removing items from the shopping cart. I have used very simple core php code for creating this simple shopping cart by using get and post methods of php. Tanks... This is a grate tutorial. can you help us, Webslesson !? I have a question, This works as responsive design? also it's a very good tutorial!! could you tell us how to solve the problem! How to display all the order back in summary? What is Shopping_cart in sessions bracket ?